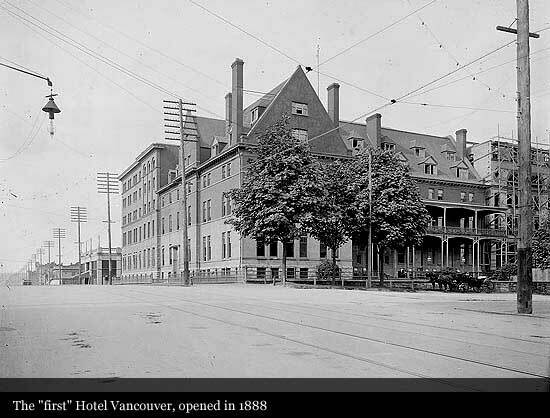 In 1887, a year after Vancouver was incorporated, ground was broken for the first Hotel Vancouver. This Canadian Pacific hotel opened on May 16, 1888; a four-storey 60-room brick structure that looked and functioned much like a farmhouse. Built on the corner of Georgia and Granville, where Sears currently stands, Canadian Pacific was criticized for the location because nobody could figure out why they would build a hotel so far from the city centre, which was then Gastown. The property eventually closed in 1916. 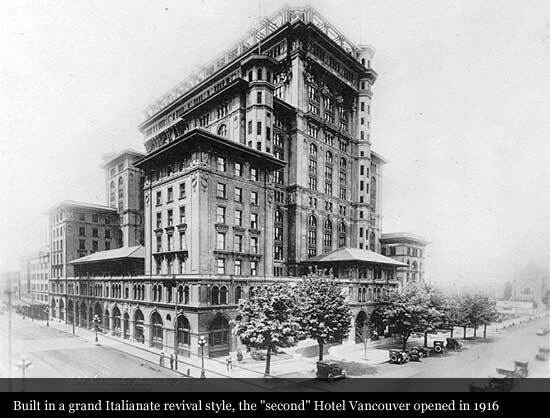 The second Hotel Vancouver, also a Canadian Pacific Hotel, opened in 1916 and closed in 1949. It was built on the same site as the first. It was a beautiful 14-storey property built in a grand Italianate revival style, and was considered one of the great hotels of the British Empire. 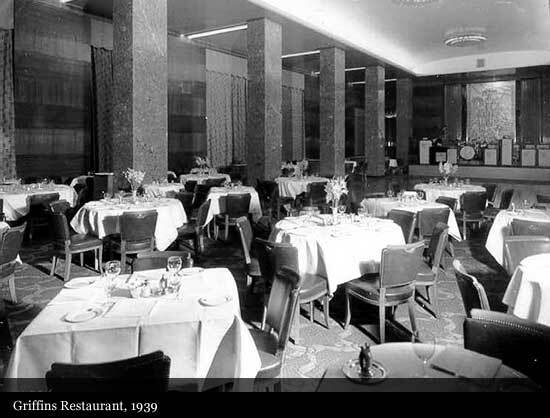 It quickly became the meeting place for Vancouver society -- the Spanish Grill, the Panorama Roof, and the Red Barrel became famous as part of the city's social whirl. 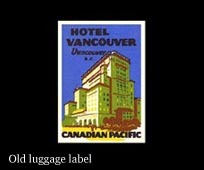 These names were later used for the facilities in the third Hotel Vancouver. Unfortunately the building was poorly constructed and soon began to deteriorate. It was eventually turned into a troop barracks during the Second World War, was later closed, and finally torn down in 1949. Those familiar with Vancouver’s recent construction problems affectionately refer to this hotel as Vancouver’s first leaky condo. The ground was broken on December 4, 1928 by E.J. Ryan Construction Company for the third and present Hotel Vancouver. The project was started by Canadian National Railway and was eventually completed in joint partnership with Canadian Pacific Railway. Construction stopped for five years during the Great Depression. For several years the building sat as a steel skeleton until Parliament committed $2 million. The project was finally completed under a joint operating agreement between Canadian National Railway and the Canadian Pacific Railway. Construction was hastily completed in 1939 in time for the Royal visit, at a final cost of $12 million. 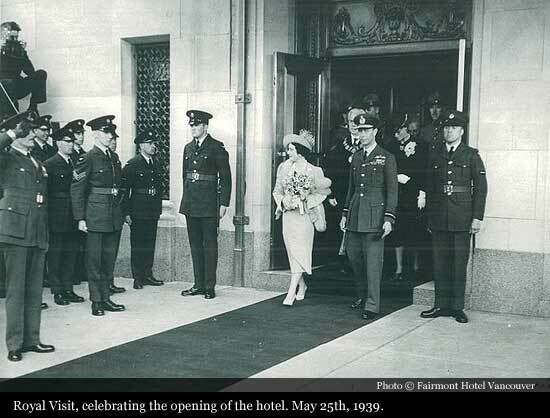 King George VI and Queen Elizabeth opened the hotel on May 25, 1939. During their visit they also opened the Lions Gate Bridge, which was built by the Guinness family to gain access to their land, which is now known as the North Shore and the British Properties. When the hotel opened, there were few buildings in the area. Christ Church Cathedral, what is now Cathedral Place, was the old Medical/Dental Building. What is now HSBC bank was the old Devonshire Hotel, and today’s Vancouver Art Gallery was then the Courthouse. Hotel Vancouver used to have massive boilers and a steam system that was used to supply these downtown buildings with steam. 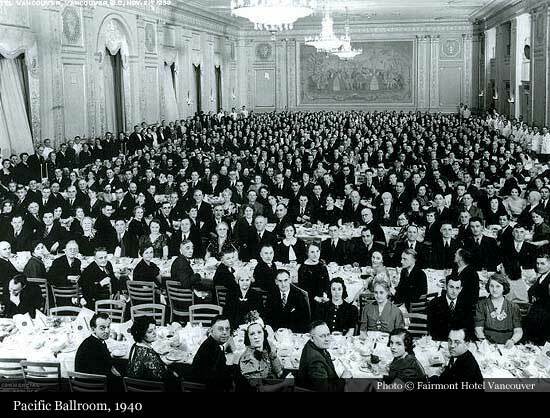 In 1939 Vancouver had approximately 2,000 inhabitants. In 2007, Vancouver had approximately 2.5 million, compared to Toronto with almost 5 million, and New York with approximately 8.2 million. 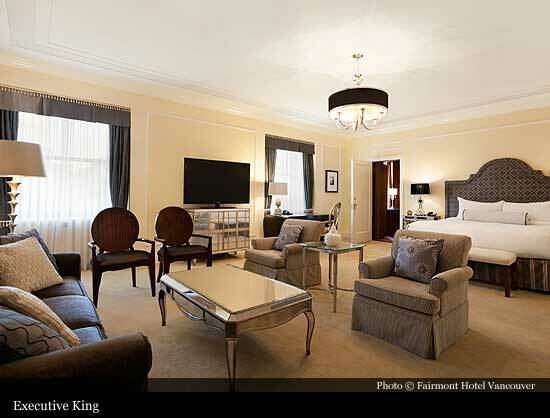 Canadian Pacific Hotels, unwilling to spend more money on a hotel it didn't own, decided not to renew its Hotel Vancouver management contract with Canadian National Railway. 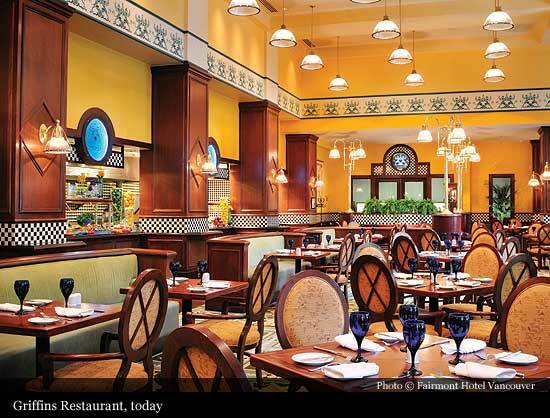 Canadian National contracted the hotel management to Hilton. 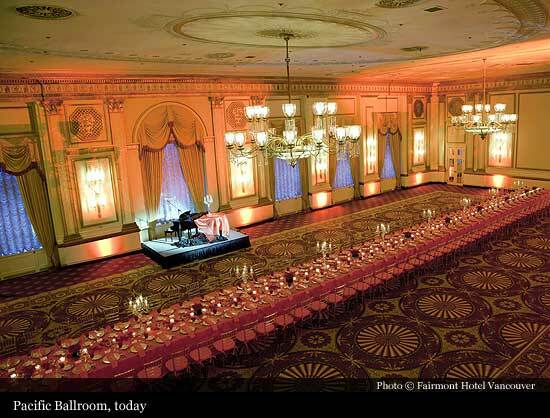 A four-year, $8 million renovation began, including the modernization to the interior design, and the addition of the British Columbia ballroom. 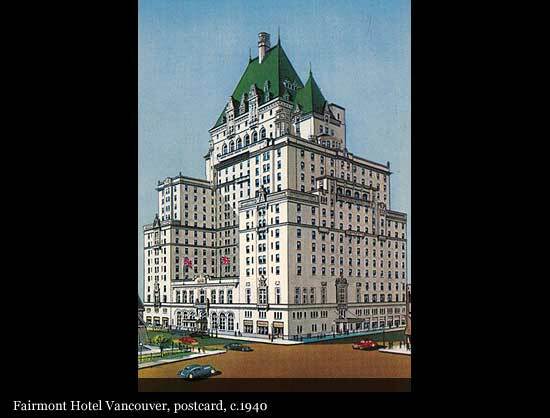 In 1983 Hilton acquires sole management Ownership comes full circle when Canadian Pacific Hotels re-acquires the Hotel Vancouver when it purchases all of the Canadian National Railway properties. 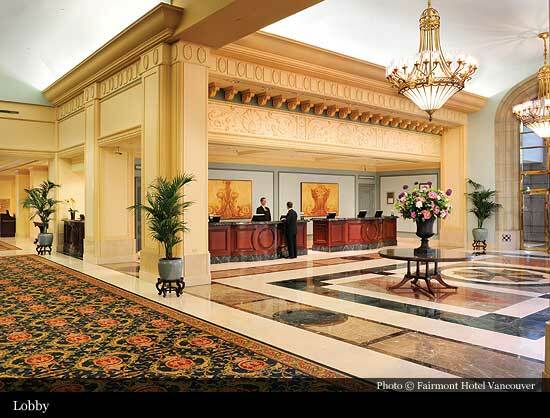 In 1996 Hotel Vancouver undertook its most recent major renovations -- transforming the lobby into the breathtaking environment that it is today. Prior to 1996, the lobby was much darker with low ceilings and bright colours, from the modernization done by Hilton in the 60s. The ceilings have been re-heightened and the present design has been restored according to original architectural drawings. $12 million was spent on the renovations, the same cost of the entire construction in 1939. 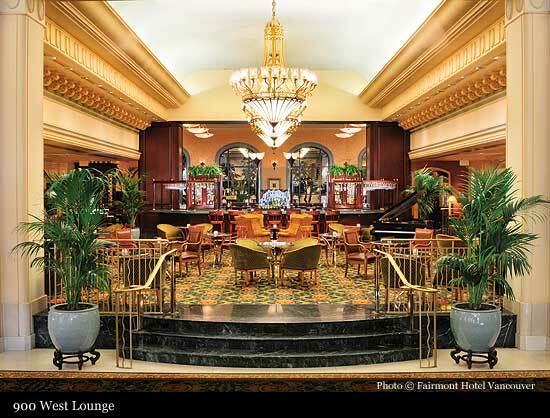 In 1999 Canadian Pacific Hotels purchases Fairmont, and changes their name to Fairmont Hotels & Resorts. The name change reflects the new international focus of the company and gave name recognition to their subsequently acquired international properties. 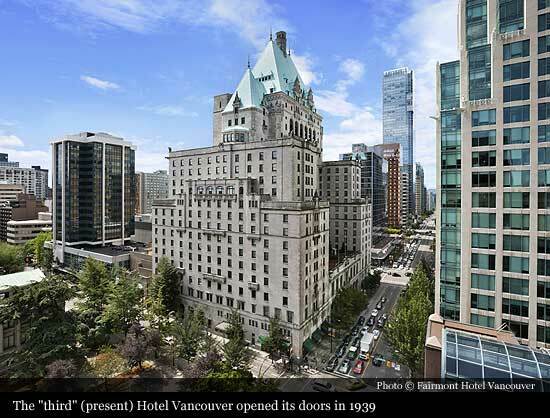 Hotel Vancouver becomes The Fairmont Hotel Vancouver.